The U.S. should leverage the prospect of new military balancing capabilities to establish an accommodation with China in the South China Sea. The South China Sea is the nexus of numerous disputes among China and its Southeast Asian neighbors, including Vietnam, the Philippines, Taiwan and Indonesia, and involving extra-regional powers like Japan and the United States. These range from territorial disputes over rocks and islands to conflicts over maritime rights to rich fishing grounds, vast hydrocarbon reserves, and critical global shipping routes. Most dangerous, however, is the degree to which these disputes have been imbued with the Great Power anxieties between the United States and China. Mollifying Sino-U.S. competition is a precondition for progress on any of these disputes. The United States should leverage the prospect of new military balancing capabilities to establish an accommodation with China that forestalls additional and potentially destabilizing militarization in the South China Sea, helping solidify the territorial status quo as de facto dispute settlement. While imperfect, this is the most promising opportunity to ensure that competition between the United States, China, and other claimants does not escalate into military conflict. For China, this accommodation means freezing the militarization of its island bases, especially in the Spratly Islands. China’s extraordinary island-building projects over the past four years give it the capacity to base significant over-lapping force projection capabilities: fighter jets, bombers, and batteries of air defense, anti-ship, and long-range strike missiles. But crucially, China has not deployed any of these force projection assets to its Spratly Island bases yet. For the United States, this requires a pledge to keep capabilities it is developing to contain China’s power projection assets out of the Western Pacific, where China would feel compelled to counter them. Concepts like the U.S. Army’s Multi-Domain Battle and the U.S. Marine Corps’ Littoral Operations in Contested Environment and Expeditionary Advanced Base Operations are designed to exert sea and air control from remote bases. Expeditionary missile batteries and sensors deployed to the islands and archipelagos of U.S. allies and partners in the Western Pacific could effectively contain the Chinese Navy and Air Force behind the First Island Chain, and potentially contribute to a blockade of air and seaborne commerce to and from China. As these concepts are still in development, the United States must prioritize turning them into deployable capabilities and thus a credible offer in return for China’s militarization freeze. Understanding how such a resolution could be achieved requires recognizing the essential role that U.S. military presence has played in diplomatic progress in the South China Sea over the last 20 years. The U.S. presence in the South China Sea began expanding in the late 1990s after China seized Mischief Reef from the Philippines in 1995, and since then the region’s territorial disputes have largely frozen – settled for practical purposes if not legal ones. 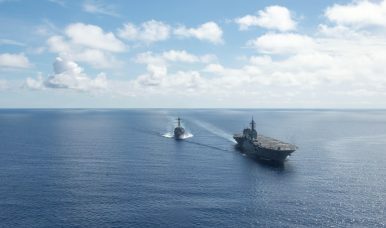 Most critically, it was U.S. military presence that motivated China to participate in talks with the Association of South East Asian Nations (ASEAN) out of a desire to limit additional U.S. involvement in the region. However, further progress has been painfully slow. Negotiations over a binding Code of Conduct between China and ASEAN, which aims to prevent disputes amongst South China Sea claimants from boiling over into open conflict, is now the region’s longest-running diplomatic effort. The recent Sino-ASEAN endorsement of a framework for negotiations was little more than a restatement of a joint declaration from 2002. In part, this is due to the pace of China’s extraordinary naval and maritime buildups, and its extensive island reclamation and construction campaign since that 2002 declaration. These activities have rapidly changed the military balance, diminishing other stakeholders’ ability to assert claims, and increasing the risk and severity of a military clash. China’s recent warning that further progress on a Code of Conduct is contingent on noninterference by “outside parties” (that is, the United States) was likely meant to avoid substantive diplomatic concessions to ASEAN to forestall increased U.S. presence in the South China Sea. This not only validates the critical role U.S. military presence played in motivating Chinese participation in ASEAN talks, but highlights why future progress will depend principally on a mutual accommodation between the two. The biggest hurdle to such an agreement is the unwillingness of either country to be seen as conceding to the other. For the United States, scaling back its military presence in the South China Sea would communicate diminished regional influence. For China, to abandon the massive island military outposts it has built would concede that its “rise” has fallen short, and would bear untenable comparisons to imperial China’s capitulations during the “Century of Humiliation,” which many Chinese policies in the South China Sea today ostensibly aim to rectify. The solution is not for either country to concede current ground or presence in the region, but to concede those prospective build-ups and capabilities that would fuel more intense competition. Many analysts believe China will use any substantial increases in U.S. military presence in the South China Sea as pretext to deploy forces to its (for now) largely empty bases in the Spratly Islands. But if China agrees to keep its fighter squadrons and missile regiments on the mainland in return for the United States keeping its (as-yet notional) expeditionary containment capabilities out of the Western Pacific, a tense but fundamentally peaceful status quo in the South China Sea can be preserved without either power being seen to withdraw. Implicit acceptance of the status quo may be dissatisfying, but it saves all parties the humiliation of officially conceding their claims, and has the virtue of being a dissatisfaction that is equitably distributed. Steven Stashwick is a writer and analyst based in New York City. He spent 10 years on active duty as a U.S. naval officer with multiple deployments to the Western Pacific. He writes about maritime and security affairs in East Asia and serves in the U.S. Navy Reserve. The views expressed are his own. This article has previously been published on the EastWest Policy Innovation Blog. Amid growing tensions, the U.S. Navy’s highest ranking officer visited the John C. Stennis Strike Group last weekend.